My server is randomly crashing for no reason, any ideas? Console.log doesn't contain anything special and there seems to be no way to reproduce it. RTB Being dead for good is right. Glass needs the pref manager ASAP. Might be rtb. Been acting up recently with the new update. You can't really do something as important as a pref manager "ASAP", it needs to be done right the first time and work reliably. It'd make more sense to fix what is causing the crashes instead of randomly re-writing systems that already exist. I am able to start a server with RTB and $Pref::Server::AutoAdminServerOwner = 1;, and join it with no issues. If you're having a crash I'm going to need a reproduction case or console trace or something to investigate, otherwise it's just a ghost story. The problem is RTB is old code that isn't efficient, it also chokes once you go over the old datablock limit. This might be another XP only issue? 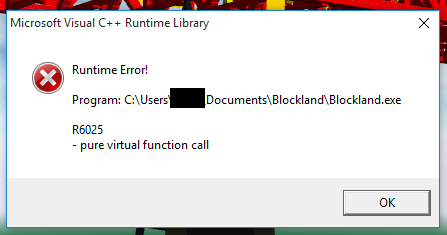 Because I just tried running Blockland on my Windows 10 computer works fine with RTB, the only issue I ran into was once I went over the old datablock limit, RTB chokes and crashes Blockland while loadinhg with a buffer overrun message and its directly linked to RTB since I can go over the old datablock limit just fine without RTB. I don't think rtb even does anything with the datablocks? It's not so much datablocks as number of add-ons. I haven't looked into it in a while but if I remember correctly, RTB does some stuff that involves concatenating all add-on names into a single string, which can easily overflow the 4KB string buffer in torque script. Hmm I tested it with script_wastedatablocks, your right, but how the hell do I find what addon is causing it? NVM Badspot's post explains it. So a temporary solution would be to not run too many addons with rtb enabled. Then again if this is the case, this might be a better fix. Why would it need to do that? which is why we're developing the standardized system. In it's update checks and add-on reporting for the server stats (as I recall), it sends all add-on names and ids in a single string instead of sending each individually. Just another way to handle data, since you don't have to worry about waiting for it all to come in separately.